It's been a nice Sunday filled with some of my favorite things...frozen yogurt, a little nap and starting a new story on my kindle. We didn't go to the gym this morning, so I cleaned a little and finally made some lunch. 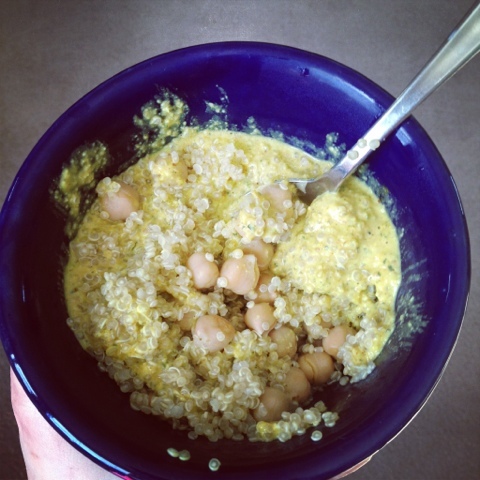 I just made quinoa with Mmm sauce and chickpeas. After lunch, I napped as the sun shined in our front window. It was glorious! 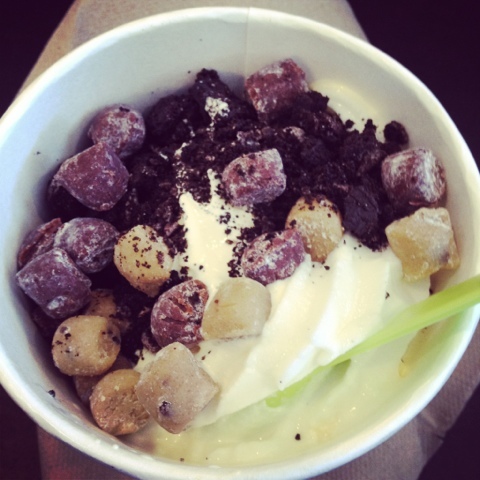 We haven't been to Yo Mama frozen yogurt all winter, so we finally went today. I was happy I checked out their website for flavors as I saw these coupons to draw customers in during the winter months. 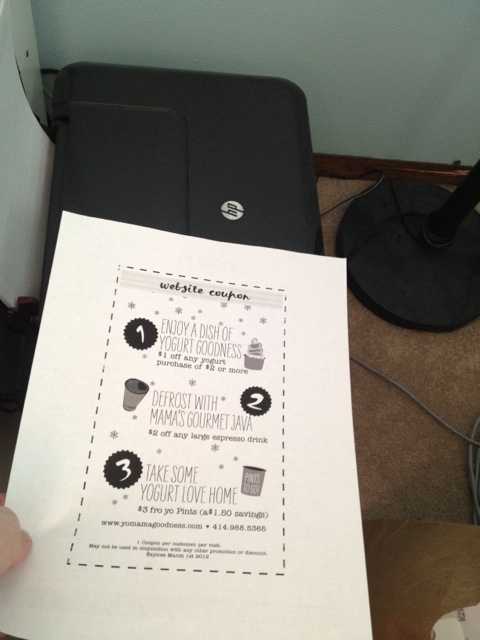 The best part was that I was able to print it to my wireless HP printer from my iPhone using the HP ePrint app. We both got $1 off our yogurts! It was packed in Yo Mama. We weren't the only ones commenting on that fact since it seems kind of odd to be eating frozen yogurt on a cold winter day in January. 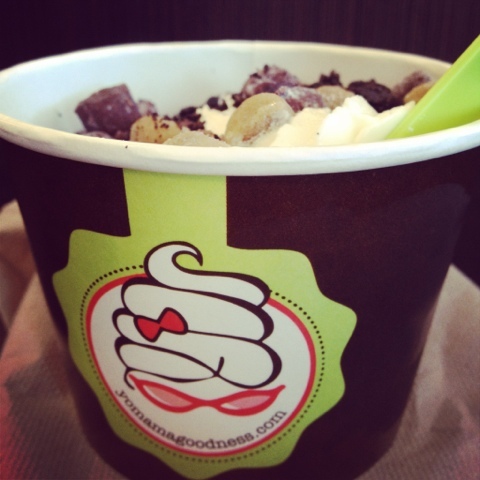 I had Cake Batter swirled with White Chocolate Macadamia and topped with brownie bites, chocolate chip cookie dough bites and crushed Oreo cookies. We left downtown Tosa and walked around Mayfair mall a bit, just to walk indoors somewhere. 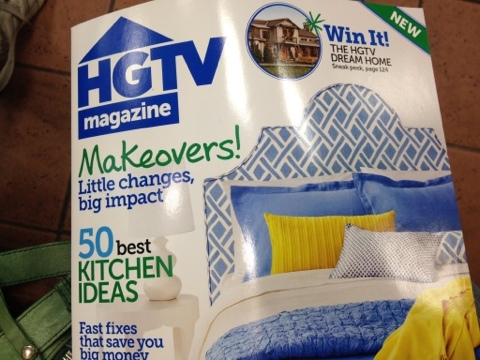 I looked through the new HGTV magazine at Barnes and Noble. It's filled with some pretty good information. 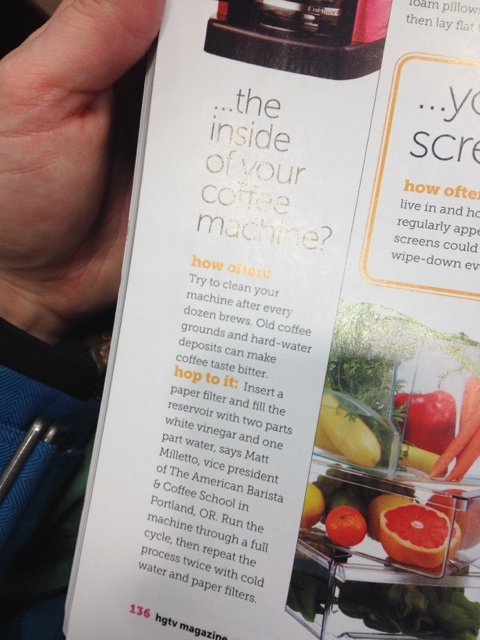 The magazine reminded me of something I had been meaning to do for a while--cleaning the coffee maker. So, that's what I am doing currently and the house smells of vinegar. I hope the coffee I brew up tomorrow morning tastes fantastic! I started a new book today. 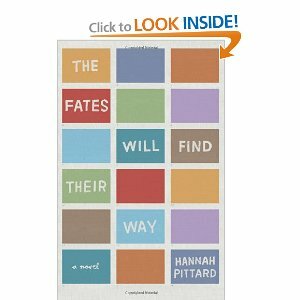 It's one I am borrowing from the digital library and I heard about it through the Boswell Books blog. It's pretty intriguing so far! Now it's time to catch up on my Google Reader. I have tomorrow off, so this Sunday night doesn't feel so depressing. Have a great Sunday night! Hope you're enjoying your day off!